Properties for sale in Brittany, France - AHIB-2-JMJ-PS Kergrist 56300 Two fully renovated houses and a cottage to finish, outbuilding with hot tub, plus double garage, standing on a plot of 5,000 sq. metres (just over an acre) on the edge of a thriving village. This handsome ensemble is 7kms north of Pontivy, and about 10 kms from the renowned Lac de Guerledan... an established tourist attraction. This is more than simply a business, it's a lifestyle. 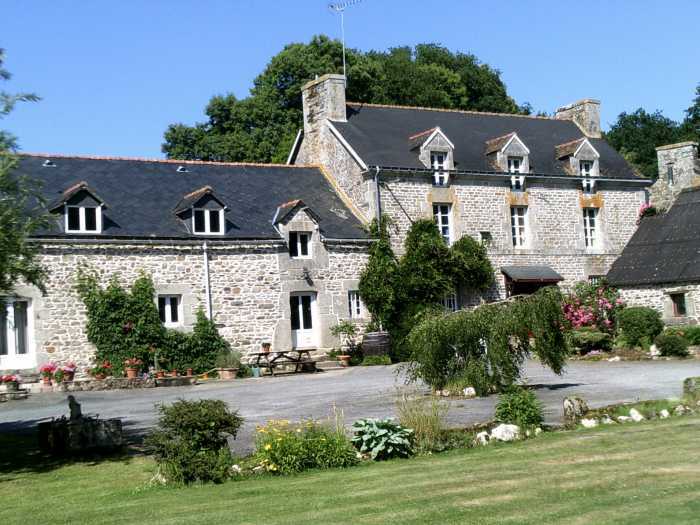 Start a new life in Brittany in this stunning property, providing an income as well as a lovely home. A grand old "Maison de Maitre", currently let as a holiday property, plus a converted barn as the owners home as well as a cottage renovation to finish to provide further accommodation. Both the main houses are sympathetically restored, retaining many original features, set in a perfect location on the edge of the busy little village of Kergrist. The property benefits from mains drainage (so no worries about fosses conforming to new regulations), gas central heating, mains water and electricity, all electricity and telephone wires are underground. Broadband internet is in place. This charming property has been the current owners home and business for the past 13 years, a successful letting history with repeat and referral business as well as new clients each year. The business potential could be enhanced by the addition of further bedrooms on the third floor of the letting house, completion of the cottage and even the addition of a swimming pool and tennis court. This former "Maison de Maitre" which is currently successfully let as a holiday home providing a good income. Built at the beginning of the 18th. Century, this is a very grand and imposing building providing spacious accommodation yet fully equipped with all modern conveniences. Total current living space approximately 180 sq metres (Further loft area of approximately 75 sq metres ready for conversion). Mains drainage, gas central heating, broadband connection, satellite TV. Spacious characterful Farmhouse Kitchen with all modern appliances (5.8 x 4.8 m) Central heating radiator. There is a large feature chimney breast which could house an Aga or be opened up for a wood burner flue, or indeed another open fire. Tiled floor. Living room with feature open fire place (in use), strip wood floor. Exposed stonework. (5.6 x 4.8m). Central heating radiator. First floor - accessed via a hand turned oak staircase leading from the hallway to a landing area (3.1 x 1. m) giving access to:- Two large double Bedrooms with central heating radiators, modern en-suite shower facilities, (Each bedroom is approx 5.9 x 3.8m, each shower/wc is approx 1.8 x 2m). Twin Bedroom (2.7 x 3.9 m) central heating radiator. An unconverted area (12 x 6.3 m) which would provide ample room for two further en-suite bedrooms. To the rear of the house is a large garden laid mostly to lawn including a private patio area with stone built barbeque. There is a variety of fruit trees such as apple, plum and pear. Insulated loft space with access. The Cottage: This is a partially converted cottage, sitting at right angles to the house, which when finished would provide one double-bedroomed accommodation. (Ground floor 5 x 7m. First Floor with reduced head height 5 x 6 m). - Rustic open fronted stone barn currently housing the hot tub (approx 13 x 5 m). Outside: Well established front garden with a variety of trees and shrubs. Large lawned area and tarmac yard providing ample parking space. Rear garden with a variety of established trees including plum, cherry and apple with a large lawned area and private rear terrace with Barbeque. RENTAL INCOME On average the holiday house is let for 20 weeks of the year, this is as much by choice as market lead. It remains open all year round but the owners refrain from accepting bookings if family and friends want to stay, or if there is maintenance work to do. The finishing of the cottage and conversion of the second floor of the holiday let would substantially increase the revenue, as would the addition of a swimming pool and/or tennis court. The nearby, historic town of Pontivy, is just a 10 minute drive away. There are good schools, restaurants, shops and hospitals. This is a university town, a lively area of Brittany. This property is within easy reach of all three coasts, and 10 minutes drive from a huge lake with water sports and beaches. Please contact the owners for more information. A few words from the vendor! Can you imagine a world where there is practically zero crime and you never live in fear for yourself or your goods? A place where we never lock our car and seldom our house. We've haven't seen a policeman in our village over the last 13 years. Can you imagine a world where the youth do not wear hoodies and do not have mobile phones constantly in their hands or glued to their ears? Can you imagine walking into a bar you've never been in before and everyone, without exception, shaking your hand and saying hello? Can you imagine buying a good bottle of wine for under £2.00 and a really nice 3 course meal in a quality restaurant for around £15.00? Can you imagine a place where you never see litter? Can you imagine a world where the older you are, the more respected and venerated you become. Where everyone on seeing the oldest man or woman will slightly doff their hats as a mark of respect. Can you imagine a world where designer clothes or flashy cars mean absolutely nothing? Where you are accepted for who you are rather than what you represent. We live in a small village of some 600 people in Brittany in Northern France. We have a beautiful home and a second home attached that is rented out to holidaymakers. We have done this for over 13 years and generate a comfortable income that is enough to sustain our lives out here. You will not get rich but the quality of your life will become priceless. We are selling our dream life and lifestyle and this is a real opportunity for someone to change their lives. Are you excited enough to want to make this change now? Out here space is not at a premium, you do not live cheek by jowl with neighbours. Boundaries are not an issue, we are offering two wonderful spacious homes surrounded by green fields and yet within walking distance of two bar/restaurants and the village shop. We have been trading for 13 years and have an excellent letting history averaging 20 weeks per year. There is the possibility of extending and improving the current facilities either to grow the business or accommodate extended family.